An afternoon was well spent with delicious food and of course great service. A 20 year old restaurant, which is well known to most of the people in and around vicinity! The place is so confident about the taste and consistency of each dish, which made successful. It’s a paradise for every Seafood lover. They have revamped the place and look completely modern and it won’t be wrong to call the place as fine-dine restaurant looking at the placement of those tableware and best in class service. The place serves authentic food from Mangalore along with North Indian and Chinese. Since, the North Indian and Chinese stuff are comparatively best. So, certainly not wrong to give a try! However, the first preference should be more of Seafood. When they were ordering and burping Prawns Ghee Roast, Pomfret Rava Fry, Anjal Tawa Fry, Crab Masala Fry and many more, their reaction was spellbound. I was told that, these are some of the signature dishes and my friends thoroughly enjoyed as if there is no tomorrow. Coming to Vegetarian Prospective, they got pretty decent fare of vegetarian dishes like Mushroom and Paneer Ghee Roast, Pathrode, Pulimuchi and to accompany they have Neer Dose, Pundi and Kotte under their specialty. Believe me, these are best and such a soulful food. One must definitely try their Palak rice, which is just perfect and appreciated by others who don’t prefer vegetarian food. The Ghee Roast over here is best among other restaurants in the town and also, its consistent. When I tried Mushroom and Paneer Ghee Roast, the first impression I got was freshness. The Ground Masala tossed in Ghee forms a real bliss. A recommended dish for sure. When it comes to Goan Style Chili Mushroom, it looks simple yet loaded with lot of peppers and kokam. The dish has sweet, sour and spice, that’s the beauty of this dish. Do ask for extra spice as per your choice. Pulimuchi is another common dish across homes at Coastal Region, here its insanely good. The taste of it is just perfect & goes very well with Neer Dose, Pundi and Kotte Idli. The drumsticks in the dish addition forms great flavor! 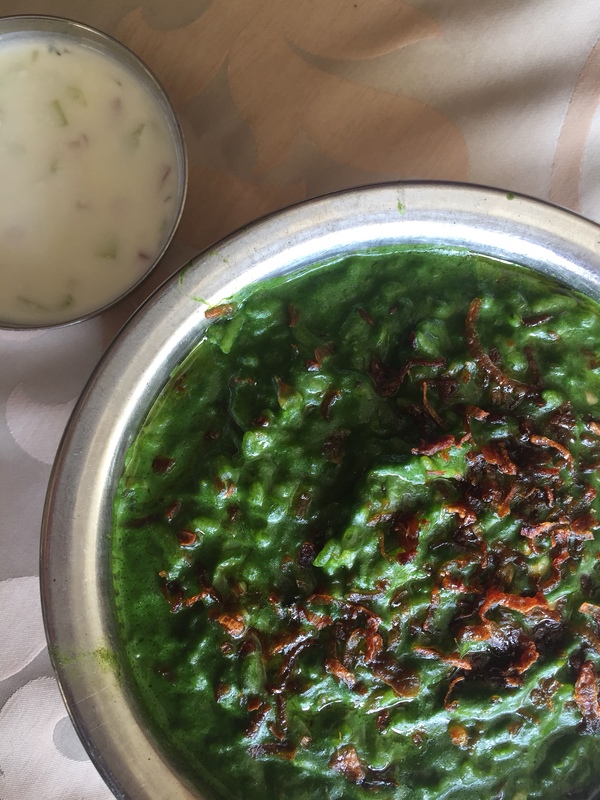 As I mentioned above, Palak Rice is another signature dish and served extremely hot. The dish has unique flavours because of the minced Garlic, Jeera and chopped onions. Recommended dish though its not part of coastal fare. The meal isn’t complete without a Dessert, so you must try Ragi Manni – It looks like Panacotta made out of Ragi and Jaggery. The dessert is not too sweet, which made me to try throughout my visits. Well, I am talking about Sea Rock Restaurant in Kumara Park, Bangalore. Nice post with amazing recipes. Thanks for sharing & keep updating.